I have a couple of items in an exhibit at Abecedarian Gallery in Denver, Colorado. The exhibit is called "Boxy Books". There are two of my items in the exhibit and both are made with papers that were painted and scribbled on by my son when he was two and three years old. One is an origami cube full of origami cubes and the other is a book inside a box. This exhibit runs until July 3rd. If you happen to be in Denver, be sure to check out the show. Over at the Book Arts Forum, we are having another book swap. This time we were supposed to incorporate a material that we had never used. I decided to get some FIMO clay and see if I could incorporate it into a book since I've never worked with any clay products before. This clay is shaped and then baked (shape-n-bake, heheh); a rather simple process. In the end, I decided to go with a few FIMO "inlays" on the front cover. And there are a couple matching beads attached to the fore edge ties. I sent this book to Kiley. 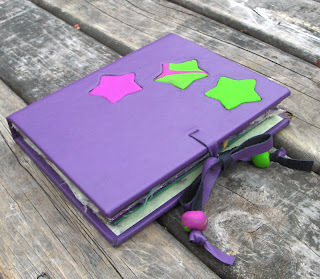 It is covered with purple leather and the clay stars are embedded into the front. There are two signatures sewn through the spine with an X stitch. 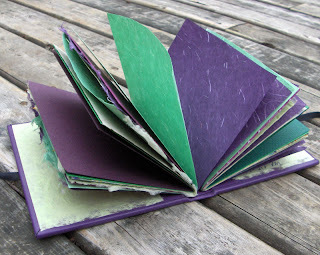 The pages are a mix of purple and green papers, cardstock, mulberry paper, etc. 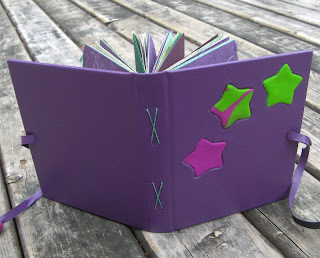 This is great and I like the idea with the FIMO Stars. It really is a lovely little journal! Thanks again! thanks monica and merry. and kiley, so glad that you like it!! The book for Kiley is just beautiful. Makes me realise I have to get my act together and get back into Book Arts Forum and book making. 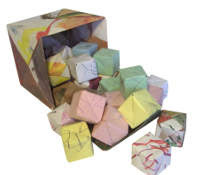 I also love the origami box of origami boxes. I'm rapidly collecting a pile of my 3 year old's paintings and drawings and I think I'll start making things with her using her papers.